My Page What is level? Level is a convenient indicator of GOLFZON users' golf performance. There are 15 levels in total. 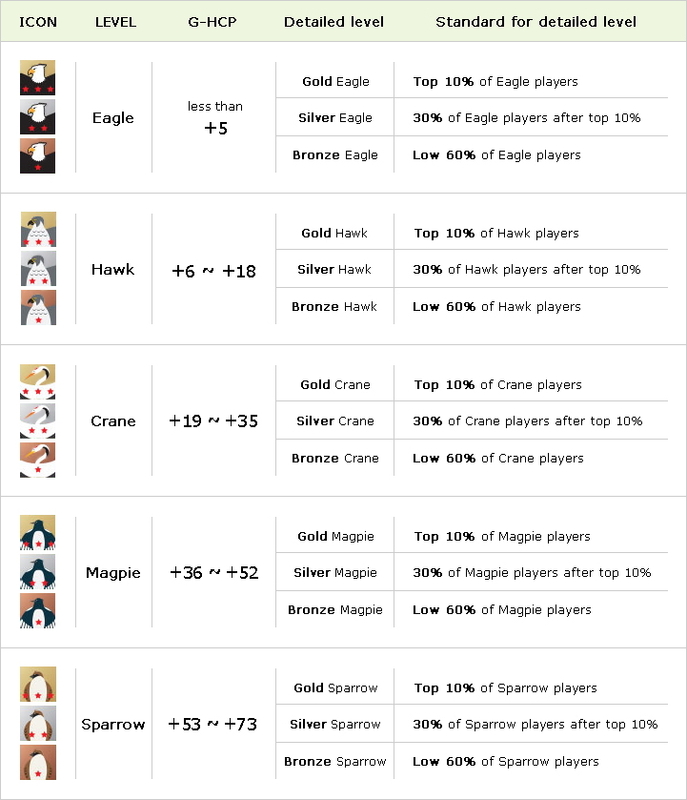 First, users are categorized into 5 different bird levels ( Eagle, Hawk, Crane, Mapie, Sparrow) depending on G-HCP. Then each bird levels are specified into three detailed levels (Gold, Silver, Bronze). * Intended level: Users with less than 20 round records are assigned to this level until they accumulate enough records to calculate accurate G-HCP level. * Dormant level: If the user has no 9H or 18H record in recent 3 months, the user's level is changed to inactive level. In order to reactivate your G-HCP level, complete at least one round of 9H or 18H.